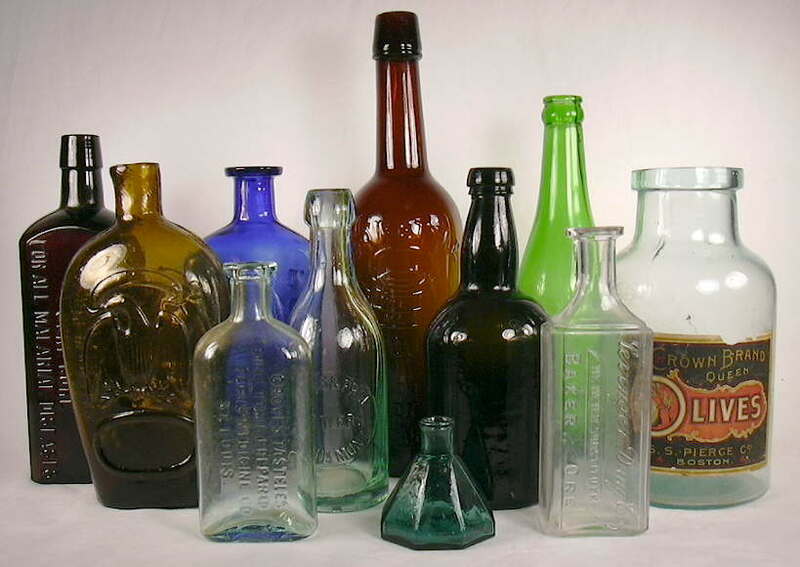 This page provides some examples of how to use the website (primarily the Bottle Dating pages) to determine the approximate date or date range for various types of bottles made between the early 1800s and the mid-20th century. The bottles used for illustration are a small but diverse assortment designed to give users guidance on how to work a bottle through the dating information to answer the Homepage's primary question #1 - What is the age of the bottle? The example bottles are tracked though the Bottle Dating page questions in that pages directed sequence. Hyperlinks (in green) to the specific dating questions on the Bottle Dating page are included so that a user can reference the necessary portions of that page. Each of the green question hyperlinks result in a pop-up page showing the particular question on the Dating Page; once read it should be deleted to avoid clutter. To return from other accessed hyperlinks, use the back arrow on your browser. If a user needs to refresh themselves on the terminology used to describe the various parts of the bottle, click on Bottle Morphology to view a pop-up page of physical bottle feature definitions. Once the likely bottle age or date range is determined, some examples of other places to look for more information is provided. EXAMPLE #1: Click on the bottle photo to view a larger version of the image. -It is about 9" (23 cm) in height and 2 3/8th inches (6 cm) in diameter. -It is made of thick, heavy glass for its size, weighing almost 1 lb. -There are molded (embossed) "swirls" on the shoulder and upper body of the bottle. -The glass is clear (colorless) with just the slightest "straw" tint when looking through the thick portion of the base. -Embossed on the base is MISSION DRY CORP., some numbers & letters, and a symbol. 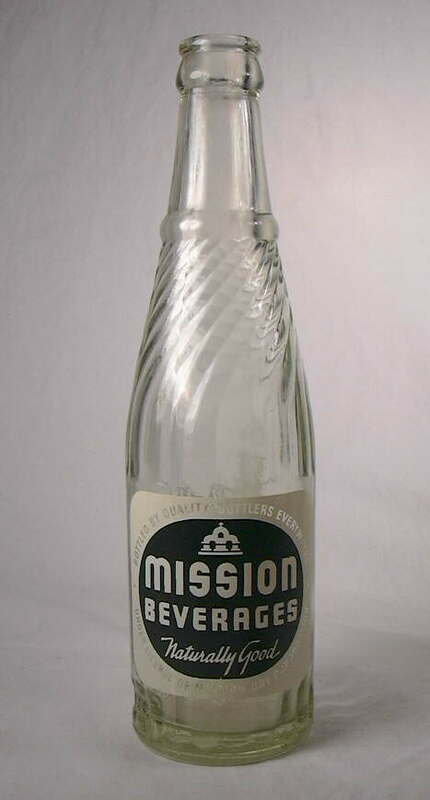 -The Mission Beverages "label" appears to be painted or silk-screened onto the bottle. -Capacity is embossed as Net Contents 10 ozs. on the lower back side of the bottle. Start with Question #1 on the Dating page. It is apparent that the answer to Question #1 is "YES" since this bottle has raised embossing in the form of the "swirls" on the shoulder. The embossing indicates that this has to be a molded bottle and can not be either free-blown, dip molded, or from a turn-mold. The user is now directed to move to Question #2 which deals primarily with the side mold seam. The picture to the lower right is a close-up of finish of the Mission bottle. It shows that the side mold seam does go up to and through the finish/lip all the way to the top of the bottle. The bottle also does not have a ground down surface on the top of the finish. This yields a "YES" answer to Question #2 and we know that this is a narrow mouth/bore machine-made bottle which very likely dates no earlier than 1905 and probably 1910. A user would first read through the introductory section of Machine-made Bottles for general information about machine-made bottles, then move on to the first question in that section - Question #8 - which deals with the glass color. Since the bottle appears clear or colorless, "B" is the answer that fits this bottle. In reading through "B", there are a couple other options available to help refine the dating a bit. If one looks closely at the thick glass in the base of the bottle, one can see that the glass is not quite perfectly colorless, but instead has a slight "straw" or washed out amber tint to the glass (picture of base below). This is a result of using arsenic and/or selenium as the glass decolorizer. Looking at the two options under Question #8, it is clear (no pun intended) that this bottle matches refinement #2 which makes it highly probable that this bottle dates after 1920 and but probably no later than the 1960s. We now have refined the bottle age range a bit more - between about 1920 and 1960. Move to Question #9 dealing with bubbles in the glass. A close look at the picture indicates no bubbles in the glass, though subtle glass details cannot be easily portrayed in a picture. In hand, the bottle does not have any bubbles in the glass. Since the glass is without bubbles, it likely dates during or after the mid-1930s. Go to the next question. Question #10 is not pertinent to this bottle as it does not have the statement Federal Law Forbids Sale or Reuse of this Bottle embossed in the glass and it not a liquor bottle. Go to the next question. Reading down through the narrative in Question #11, we find out that the number just to the right of the Diamond-O-I mark is the last two digits of the year the bottle was manufactured, which on this bottle is a "46". So at this point we know that this bottle was made in 1946. A user need go no further through the Dating page questions to refine the date further. However, for example sake we will continue through the questions. Note: For more information on Owens-Illinois marks, see Bill Lockhart and Russ Hoenig's (a retired senior engineer for Owens-Illinois) recent work - available only on this website - at the following link (pdf file): Owens-Illinois Glass Company (Lockhart & Hoenig 2015). Question #12 deals primarily with cork versus screw top closures. This bottle has neither of the closure types noted; it instead has a crown top. Thus, under this question the bottle classifies under option "C" - Other Closure/Finish type with no further date refining possible under this question. Question #13 covers Applied Color Labels (ACL) which this bottle does have. A close-up of this bottle's ACL is actually shown under Question #13 on the Dating page. As the information under this question notes, ACL's in the U. S. date no earlier than 1933 and are still being made though most American soda bottles with this feature are from before the 1980s. By considering the dating information arrived at above - excluding the makers markings on the base - we can still make a reasonable determination that this bottle almost certainly dates no earlier than 1933 (ACL, lack of bubbles) and could be as recent as the 1960s (straw tinted colorless glass). The makers mark cinches the date in the 1940s of course, but without this marking the bottle date could not be refined further. This site contains very limited information on specific companies that utilized bottles; such information is impossibly beyond the scope of this (or any) site (or book). A bit more information is available on this site for this type of bottle by reviewing the the Bottle Typing/Diagnostic Shapes page and by looking through the Reference Sources/Bibliography page for potentially useful references. However, if more information were desired a quick search on the internet using the words "Mission Dry Corporation" (the embossing on the base) would lead a user to an assortment of information indicating that the company was bottling as early as 1933, that its primary product was soda water, that these style Mission bottles date into the mid-1950s, and miscellaneous information about specific company products like cans, labels, etc. One of the top returns on the search list would be the "e-Book" entitled Bottles on the Border: The History and Bottles of the Soft Drink Industry in El Paso, Texas, 1881-2000. This e-Book is now posted on this website and contains an extensive amount of information on soda bottles in general as well as specifically to those used in West Texas. Click Historic Bottle Related Links page to find links to the assortment of pdf files that comprise this printable e-Book. EXAMPLE #2: Click on the bottle photos to view a larger version of the image. -Bottle is approximately 8" (20 cm) in height, 5" ( 13-14 cm) wide at its widest point, and 4" (10-11 cm) deep at its widest point; the bottle is not round but more "flask" shaped (wider than deep). -The bottle is moderately light in weight for its size, weighing about 12 ounces. -The glass is a medium olive green with off-color swirls in the glass, hundreds of various sized bubbles, and numerous un-melted sand grains which are also called stones or "potstones." -The bottle is relatively symmetrical but does have a tilt to the neck and is somewhat bulging towards the lower portions of the side (see picture to left bottom). There are no sharp lines to the bottle, just rounded corners and features. -The base of bottle is indented almost 1" (2-3 cm) from the base and there is a round, broken glass scar just slightly off-center of the middle of the indentation. -There are no markings or embossing on the bottle. This question asks if there is either any embossing on the bottle or if there are mold seams present on the body, shoulder, or neck. A thorough search of the bottle glass surface finds no embossing and no apparent mold seams anywhere. The answer to Question #1 is "NO", indicating that this bottle is either free-blown, dip molded, or from a turn-mold. The user is now directed to move to Question #3 which differentiates unembossed, seam-free bottles into several categories. Since this bottle is not cylindrical the answer to Question #3 is "NO". We now know that this bottle was either a free-blown or dip molded and that it is highly likely to date prior to 1870 - possibly much earlier. It is suggested in the "NO" portion of Question #3 that the user move to Question #4 dealing with the presence/absence of a pontil mark or scar, and if present, what type of pontil scar. 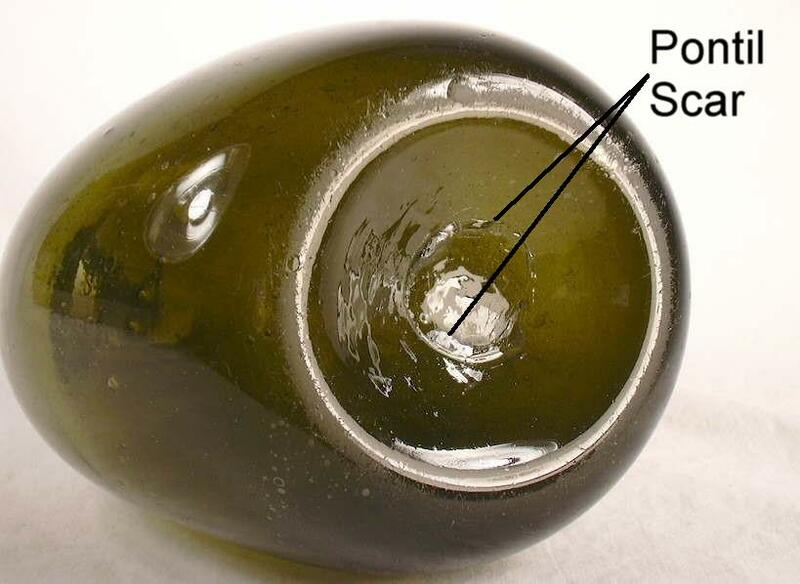 As the picture below right shows, this bottle does have a blowpipe or "open" pontil scar on the base. See the pontil scars page for more information. The blowpipe style pontil scar puts the date of this bottle as no later than approximately 1860-1865 and does indicate that it could date back to 1800 or even before. The overall crudity of the bottle would indicate a manufacturing time on the earlier end of this range. Thus, our Dating key derived age range for this bottle is 1800 to 1860, with a high likelihood of dating prior to 1850. This bottle keyed out much quicker than the first example because this is as far as the dating key goes for free-blown bottles. More information on this type of bottle - which is referred to in the collector world as a New England chestnut flask - is found on the "Liquor/Spirits Bottle Typing" sub-page of the complex of Bottle Typing/Diagnostic Shapes pages. This early American-made bottle was free-blown (not dip molded) most likely at a New England glasshouse between 1780 and 1830. References that could be consulted for this information include: Munsey (1970), Ketchum (1975), with McKearin & Wilson (1978) being the best source. EXAMPLE #3: Click on the bottle photos to view a larger version of the image. This example will date two slightly different examples of the same patent or proprietary medicine (Hall's Balsam for the Lungs) to illustrate how the Dating page questions can differentiate the age of different versions of the same type bottle made for a lengthy period. -Both bottles are approximately 7¼" (19 cm) in height, 2½" ( 6½ cm) wide, and 1½" (3 cm) deep; they are rectangular in cross section. -The glass color of both bottles is aqua or aquamarine, though the one on the left (bottle "A") is obviously a darker, "bluer" aqua than the bottle on the right (bottle "B"). -The glass of both bottles is moderately heavy for there size (right - 10 ozs. ; left 12 ozs. ), have ample bubbles in the glass, a waviness to the surface glass texture, and an overall "crudeness." -The product name embossing - HALL'S BALSAM / FOR THE LUNGS - on the front panel of both bottles is the same, though the bottle on the right also has the company name and location embossed on the side panels (A. L. SCOVILL & CO. - CIN'TI & N.Y.). The embossing on both bottles is relatively flattened and not particularly "sharp." -The rectangular bases of the bottles are slightly different - see pictures below. -The side mold seam on both bottles end below the finish, though in slightly different locations - see pictures below. It is apparent that the answer to Question #1 is "YES" since both of these bottles have embossed lettering which indicates they are molded bottles; they can not be either free-blown, dip molded, or from a turn-mold. The picture to the right is a close-up of both bottle finishes. It shows that the side mold seam on both bottles stop well below the top of the finish. On close observation it is apparent that neither bottle has a ground down top surface to the finish. This yields a "NO" answer to Question #2 and we now may conclude that these are both mouth-blown bottles almost certainly dating prior to 1915. The user is now directed to move to Question #4 - the first question in the section of the key that deals with the dating of mouth-blown bottles. 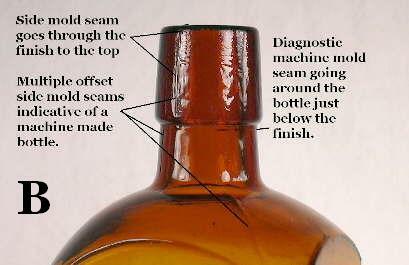 This question deals with whether the base of a bottle has a pontil scar, and if present, what type of pontil scar. The pictures below show that neither of these bottles have any evidence of a pontil scar on the base. 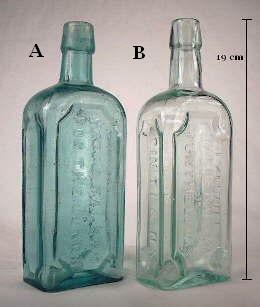 So the answer to Question #4 is "NO" which yields an earliest manufacturing date for both bottles of about 1855-1865. At this point in the Dating key we can be confident that both bottles date somewhere between about 1860 and 1915. The user is now directed to move to Question #5, which deals with way the bottle was finished, i.e., the technology or process that produced the finish or lip. Click on the picture above to see more distinctly where the side mold seams end on the two bottles. This is the point in the Dating key where our two bottles diverge from each other. 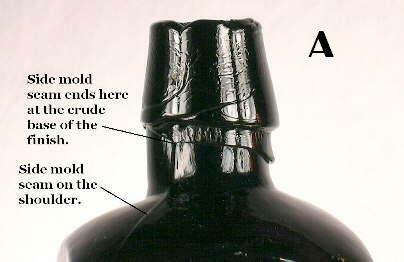 Bottle "A" has a side mold seam that distinctly ends right at the base of the finish. There is also a "drip" of excess glass on the left side of the neck that appears to have flowed from the base of the finish onto the upper portion of the neck. Given these two diagnostic features, the answer to Question #5 for bottle "A" is option A - this bottle has a "true" applied finish which very likely dates "A" as no later than 1885 to 1890. We now have narrowed bottle "A" down to a high probability date range between 1860-65 and 1885-1890. 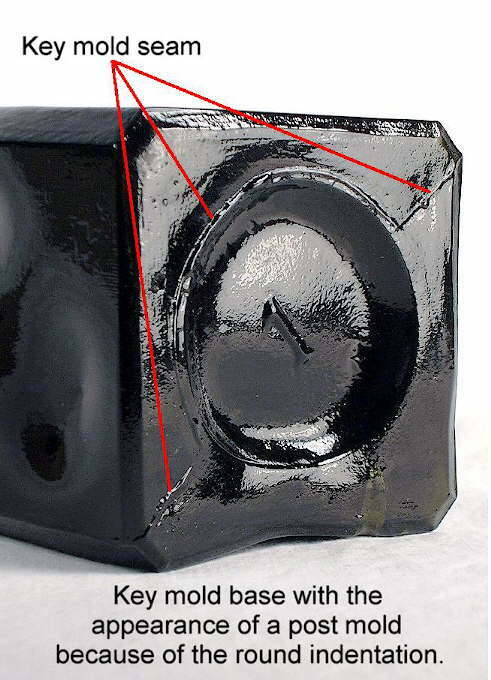 Bottle "B" differs from "A" in that the side mold seam ends a quarter inch below the lower edge of the finish and there are horizontal, concentric tooling rings around the upper neck and finish "wiping" out the mold seam. 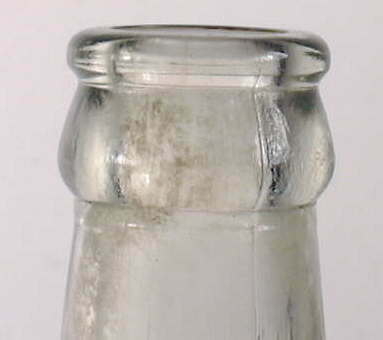 If one looks closely at the middle portion of the neck on bottle "B", there is a slight bulging out (towards the outside of the bottle) of the inside glass surface. This is a common feature resulting from the action of the "lipping" or "finishing" tool. This bottle clearly has a tooled finish which makes option B the correct choice for bottle "B" under Question #5. This feature makes it likely that this bottle dates from or after the late 1870s. We now have narrowed bottle "B" down to a highly probable date range of the late 1870s to 1915. The user is now directed under all of the Question #5 options to move to Question #6, which deals with diagnostic base features. 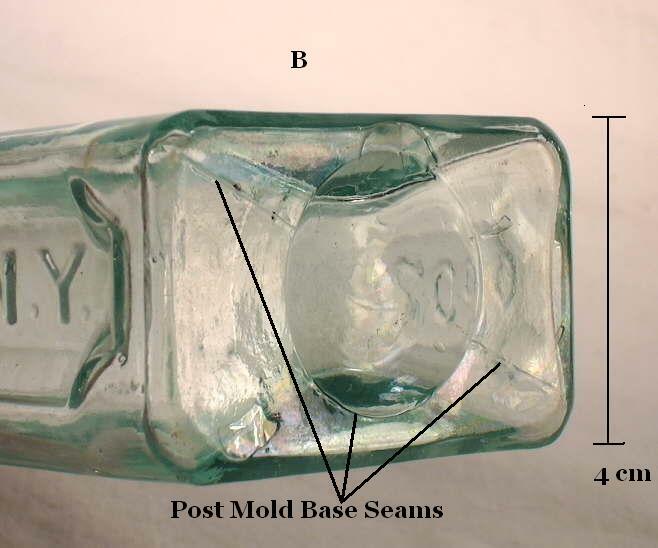 This question asks if there are any mold seams within the outside edges of the bottle base. Click on each of the bottle base pictures to the left and it is apparent that both bottle "A" and "B" have mold seams on the base. This yields a "YES" answer to Question #6 for both bottles and suggests a date of about 1890 to 1895 as the latest date that these bottles would likely have been manufactured. - Bottle "A" has a distinctive "key mold" seam - a base mold seam that has a arch or notch in the middle portion. This yields a likely date range under this question of between 1860 and the mid-1870s for non-pontiled bottles like "A". At this point in the dating, the overlapping date ranges from all the questions gives the user a narrowed probable date range of 1860 to the mid-1870s for bottle "A". - Bottle "B" has a distinct post-bottom mold base seam which is a mold seam circle centered in the base. This type base seam (without a pontil scar) has a high probability of dating between 1860 and 1890. At this point (non-pontiled base, post-bottom mold conformation, tooled finish) we now have a probable date range of between the late 1870s and 1890 for bottle "B". The user is now directed to move to the last question in the Mouth-Blown bottle section of the Dating page - Question #7 - which deals with air venting marks on the bottle surface. 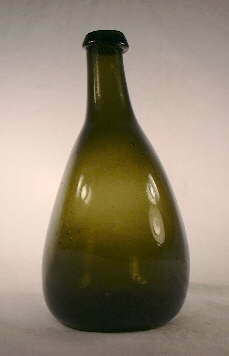 Air venting marks can be a very useful dating tool for bottles manufactured during the late 19th century. Close inspection of both bottles shows that neither have air venting marks anywhere on the bottle. This is consistent with the flattened embossing as air vented molds allowed for the production of bottles with more distinct ("sharper") embossing. This all indicates that both bottles were likely produced no later than about 1885-1890. Embossed bottles like these offer some hope for the existence of additional information on the history of the product. Since Halls Balsam was a very popular 19th century patent medicine, various tidbits of information can indeed be found in at least the following references (which are included on the Reference Sources/Bibliography page of this website): Patent Medicines and Proprietary Articles (Rimalover 1970); 19th Century Medicine in Glass (Wilson & Wilson 1971); A Collector's Guide to Patent and Proprietary Medicine Bottles (Baldwin 1973); A Bit About Balsams (Blasi 1974); Patent Medicine Tax Stamps (Holcombe 1977); The Bottle Book (Fike 1987); Pontil Medicine Encyclopedia (Odell 2000) and probably others. The Blasi (1974) and Holcombe (1977) books in particular have excellent overviews on what is known of the product history and supports the date ranges determined above. A search on the internet will turn up some scattered references to the bottle - primarily ones that are for sale or just referenced - but little historical information. EXAMPLE #4: Click on the bottle photo to view a larger version of the image. -The bottle is round and approximately 7" (18 cm) in height and 3" ( 8 cm) in diameter. -It is made of thick, heavy glass and weighs about 16 ounces. -Embossed in a round, slightly indented circle (plate mold) on the front is CLOVERDALE DAIRY CO. /ELY, RUTH & McGILL / NEV. Above the circle, ONE PINT is embossed. The reverse side and base are not embossed. From this embossing we know that this bottle is a milk or cream bottle; so the bottle type has been already established. -The glass is basically colorless (clear) with just the slightest "straw" tint when looking through the thickest portion of the base (visible in the image to the left). -There is a deeply incised circle in the middle of the base that is 1/2" (12 mm) in diameter. -There is scuffing or wear on the glass surface on the sides and contact portions of the base. -There is some very faint embossing on the front heel that appears to be a rectangle. -The side mold seams visually disappear on the upper neck well below the finish. It is apparent that the answer to Question #1 is "YES" since this bottle has raised embossing. The embossing indicates that this has to be a molded bottle and can not be either free-blown, dip molded, or from a turn-mold. The picture to the right is a close-up of the neck and finish of the Cloverdale Dairy bottle. 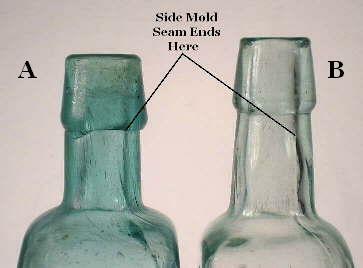 This bottle has side mold seams which fade out on the neck where indicated in the picture (click to enlarge) and do not show at any point above that on the bottle. The bottle also does not have a ground down surface at the top of the finish (i.e., rim). This feature would nominally yield a "NO" answer to Question #2, indicating it is a mouth-blown bottle and dating prior to about 1915, and move one to Question #4 on the Mouth-blown Bottles section of the Dating page complex. However, this determination would be incorrect for this bottle! We know from the embossing as well as the distinctive shape that this is a milk bottle (subject covered within the Bottle Typing/Diagnostic Shapes complex of pages). 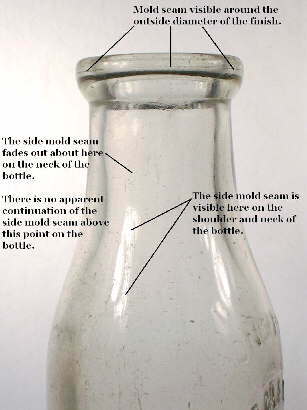 It is noted in the "Exception note" just under the "NO" answer to Question #2 that machine-made milk bottles made between the early 1900s through at least the 1940s are the major exception to the side mold seam rule as these bottles exhibit a disappearance of the side mold seams on the neck that emulates that found on a mouth-blown bottle with a tooled finish. This anomaly is described and explained more fully in the Milk Bottles section of the Food Bottles & Canning Jars typology page. However, these bottles lack other mouth-blown characteristics and have one feature that is only found on machine-made bottles made by a press-and-blow machine - a valve or ejection mark on the base. We now have a dating range - albeit a fairly wide range - for this bottle from the early 1900s to about 1950. The user is then encouraged in the note under Question #2 to move to the Machine-made Bottles section (Question #8) where one bit of additional dating refinement is that the glass has a slight straw color tint indicating manufacture after the late 1910s. 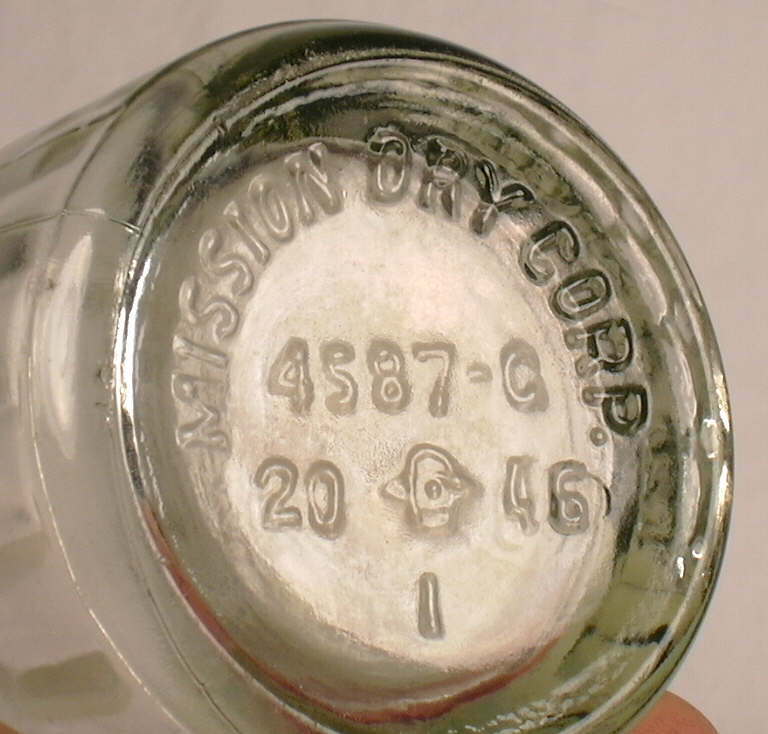 Also, Question #14 would confirm that this bottle is machine-made due to the presence of the valve or ejection mark on the base (image below left). For brevity we will skip that portion of the Dating page. Additional information on this website could be found by visiting the Bottle Bases page which would provide some information the small circular, press-and-blow machine induced valve (aka ejection) mark on the base (picture below). The noted scuffing and wear on the bottle is a result of milk bottles typically being reused dozens or scores of times (Lockhart pers. comm. 2007). There is, however, one additional bit of information that greatly assists the dating of this bottle - the very faint rectangle embossed on the front heel of the bottle. Although essentially non-readable, given the Nevada purchaser/user of the this bottle, this rectangle is certainly the makers mark of the Pacific Coast Glass Company (San Francisco, CA.) which is a divided rectangle with a "P" in one part and a "C" in the other part. Pacific Coast Glass used this mark from 1925 to 1930 (Roller 1983; Lockhart pers. comm. 2006). 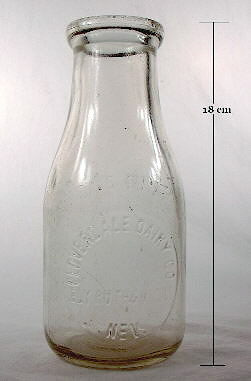 Additional information is provided by the authors half pint version of this same bottle which has the "PC in a split rectangle" mark very distinctly embossed in the same location; a very common spot for milk bottles made by Pacific Coast Glass. Thus, we now can be quite certain that this milk bottle was made between 1925 and 1930, which is consistent - though much more precise - than the date range arrived at above. This is an example of the importance of makers marks - when such a mark is present - in the entire equation of dating a bottle. If additional information on these type milk bottles was desired, some general information could be found by searching the internet and the Reference Sources/Bibliography page of this website. For example, the "Reference Sources/Bibliography" page lists several potentially pertinent works: The Nevada Bottle Book (Holabird & Haddock 1981), Nevada History Through Glass - Volume 1 (Holabird 2012), Jeffrey L. Giarde's 1989 book Glass Milk Bottles: Their Makers and Marks, and Bill Lockhart's internet e-book entitled You Can Whip Our Cream, But You Can’t Beat Our Milk: The Dairies of Otero County, New Mexico, 1889 to 1977 (Lockhart 2001) which is available at the following URL: http://alamo.nmsu.edu/~lockhart/AlamMilk/index.html. The two latter works would provide some general information on milk bottles that would be pertinent though not specific to this Nevada example. This includes dating by glass weight (Girade) which indicates a pre-WWII manufacturing date for this bottle and information on plate embossing, valve marks, finishes, closures, and more (Lockhart 2001). The Holabird & Haddock (1981) and Holabird (2012) books list the Cloverdale Dairy bottle, but includes no company dating information. EXAMPLE #5: Click on the bottle photo to view a larger version of the image. 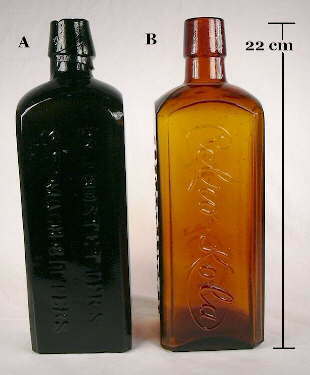 This final example will date two different age examples of bottles with virtually the same size and shape but which held different products and came from opposite ends of the country. -Both bottles are square and approximately 8¾" (22 cm) in height and 2¾" (7 cm) on each side. -Bottle "A" weighs about 21 ounces and "B" about 17 ounces. -Bottle "A" is very dark olive green in color (aka "black glass"); "B" is a medium amber. -Bottle "A" is embossed vertically on one side with: HOSTETTER'S / STOMACH BITTERS; bottle "B" is embossed on three sides with CELRO-KOLA (in script lettering) on two opposite sides and CELRO-KOLA CO / PORTLAND, ORE. on one in-between side. -The morphology of both bottles is very similar: bases which have a round indentations in the middle though with some minor differences (pictures below); vertical panel edges which are beveled; base edges which are narrowly beveled; long tapered finishes; and shoulders which have the same slope and "look." It is apparent that the answer to Question #1 is "YES" since both bottles have raised embossing. The embossing indicates that these have to be a molded bottles and can not be either free-blown, dip molded, or from a turn-mold. This is where the two bottles quickly diverge in the key. 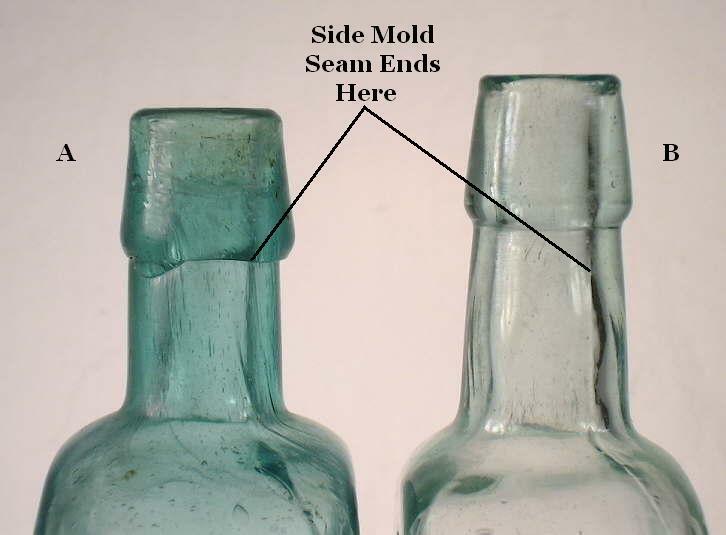 Bottle "A" has a side mold seam which ends immediately below the sloppy base of the finish as shown in the picture to the right (upper). This yields a "NO" answer to Question #2 and we now may conclude that "A" is a mouth-blown bottle likely dating prior to 1915. Bottle "B" does not have a ground down surface on the top of the finish but does have a side mold seam which goes up through and to the top of the finish - see picture to right (lower). It also has the highly diagnostic horizontal mold seam circling the neck just below the bottom of the finish as well as the multiple and offset seams that are indicative of a machine manufacturing. This yields a "YES" answer to Question #2 and we know that this is a machine-made bottle likely dating it no earlier than about 1905-1910. To keep the dating less confusing here, we will first finish with bottle "A", then move to bottle "B" further down the page. BOTTLE "A" - As noted above for bottle "A" the user is directed in Question #2 ("NO") to move to Question #4 for bottle "A" - the first question in the section of the key that deals with the dating of mouth-blown bottles. This question deals with whether the base of the bottle has the presence/absence of a pontil mark or scar, and if present, what type of pontil scar. The picture to the left top shows that bottle "A" has no evidence of any type of pontil scar or mark on the base. So the answer to Question #4 is "NO" which indicates that bottle "A" is not likely to date prior to 1860-1865. So at this point in the Dating key we can be confident that bottle "A" dates somewhere between about 1860 and 1915. 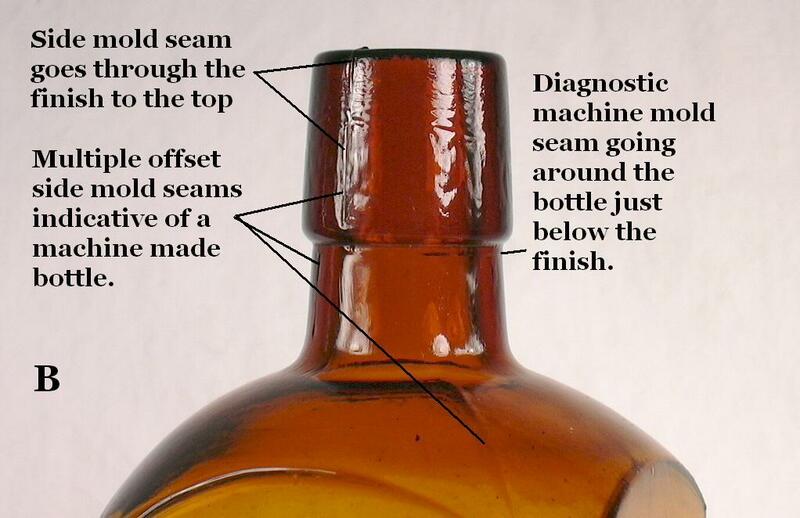 The user is now directed to move to Question #5, which deals with way the bottle was finished, i.e., the technology or process that produced the finish. 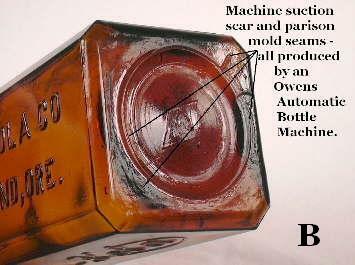 Click on the "A" picture above to see more distinctly where the side mold seams ends on this bottle. This bottle has a side mold seam that distinctly ends right at the base of the finish. There is also an obvious and almost "sloppy" excess of glass flowing from the base of the finish onto the neck. Given these two diagnostic features, the answer to Question #5 for bottle "A" is option A - this bottle has a "true" applied finish which very likely dates "A" as no later than 1885 to 1890. We now have narrowed bottle "A" down to a high probability date range between 1860 and 1885-1890. The user is now directed to move to Question #6, which deals with diagnostic base features. 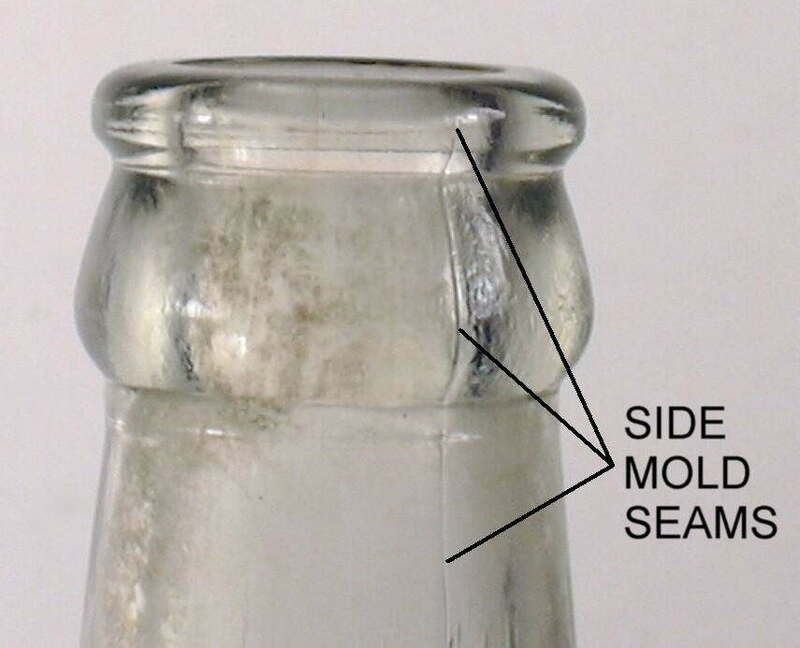 This question asks if there are any mold seams within the outside edges of the bottle base. 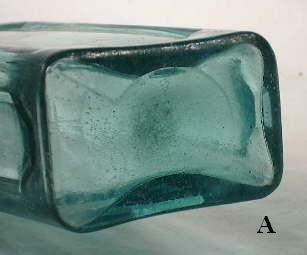 Click on the base picture for "A" to the upper left and it is obvious that this bottle has mold seams on the base. This yields a "YES" answer to Question #6 which helps confirm that this bottle was made no later than about 1890. Under the "YES" answer for Question #6 there is more dating refinement possible based on the type or orientation of mold seams on the base. 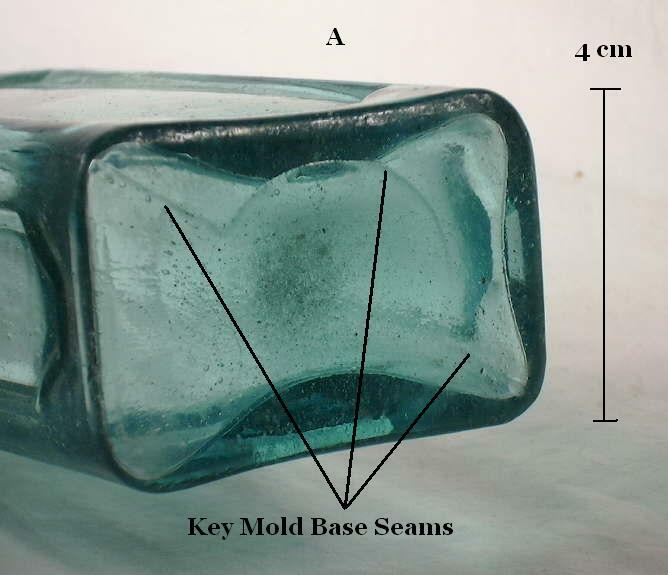 Bottle "A" has a distinctive "key mold" seam - a base mold seam that has a arch or notch in the middle portion. This yields a likely date range under this question of between 1860 and 1875 for non-pontiled bottles like "A". At this point in the dating, the overlapping date ranges from all the questions gives the user a much narrowed probable date range of 1860 to 1875 for bottle "A". The user is now directed to move to the last question in the Mouth-Blown bottle section of the Dating page - Question #7 - which deals with air venting marks on the bottle surface. 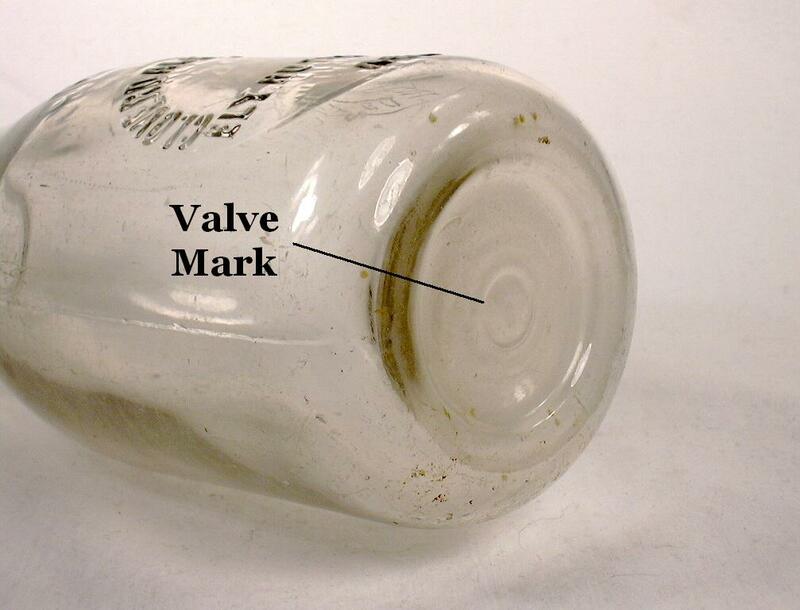 Air venting marks can be a very useful dating tool for bottles manufactured during the late 19th century. Close inspection of bottle "A" indicates no evidence of air venting marks anywhere on the bottle. This is consistent with the very flattened embossing on this bottle (can not be seen in the picture). This indicates that bottle A" was produced prior to 1885-1890. The lack of air venting does not help with the dating refinement of bottle "A" so we actually reached the end of dating with Question #6 and its conclusion that bottle "A" was highly likely to have been blown between 1860 and 1875. Note: The S. S. Bertrand which sank in the Missouri River in April 1865 had dozens of cases of these black glass Hostetter's Bitters on board. It is likely this bottle also dates from that era, i.e., the 1860s as the bottles made from about 1870 and later were largely amber in color with black glass phased out as a glass color (empirical observations). Since bottle "B" is amber in color "C" is the answer that fits this bottle; no dating refinement is available under this question. Move to Question #9 dealing with bubbles in the glass. 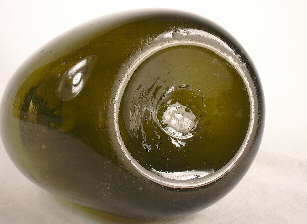 Though not visible in the pictures above, a close look at the bottle in hand indicates a few moderate (⅛" to ¼") sized bubbles spread around the bottle glass. Since the glass does have significant sized bubbles, it likely dates during the period between 1905-1910 and 1920s. Move to the next question. Question #10 is not pertinent to bottle "B" as it does not have Federal Law Forbids Sale or Reuse of this Bottle embossed in the glass. Go to the next question. Question #11 deals with the presence or absence of the specific bottle makers mark for the Owens-Illinois Glass Company. 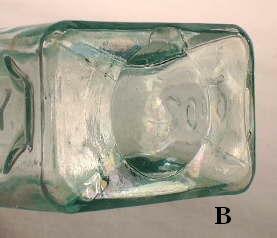 The base picture of bottle "B" does show a diamond (with "273" inside) on the base, but it is not the distinctive "Diamond O-I" marking shown under this question. Question #12 deals primarily with cork versus screw top closures. This bottle has a cork closure finish so under this question the bottle classifies under option "A" - Cork Style Finish. This gives added evidence that the bottle definitely dates prior to 1930 or so. Question #13 covers Applied Color Labels (ACL) which this bottle does not have. Given all the information above, we can quite confidently conclude that bottle "B" dates somewhere between about 1910 and the early 1920s. Additional information could be found elsewhere on this site - in particular on the Bottle Typing/Diagnostic Shapes page. This style and size of square amber "bitters" or "tonic" bottle with a cork style finish usually dates no later than the mid 1920s and is actually relatively uncommon as a machine-made item; most have mouth-blown features. To summarize Example 5, we have two morphologically and stylistically very similar bottles which were likely manufactured about 50 years apart. This is an example of why bottle styles and/or shapes can be poor indicators of age by themselves and why using several diagnostic features can dramatically narrow down the likely manufacturing period of a bottle. Once again more information could be found on these bottles by searching the internet. The most information can be found on Hostetter's Bitters which was one of the most popular American bitters products between the mid-1850s (first introduced in 1852 [Odell 2000]) and about 1920, although it was made until at least 1958 as a "tonic" instead of a "bitters." This websites Reference Sources/Bibliography page lists several works which have information on Hostetter's: Western Bitters (Wilson & Wilson 1969); For Bitters Only (Ring 1980); The Bottle Book (Fike 1987); and Antique Western Bitters Bottles (Wichmann 1999). 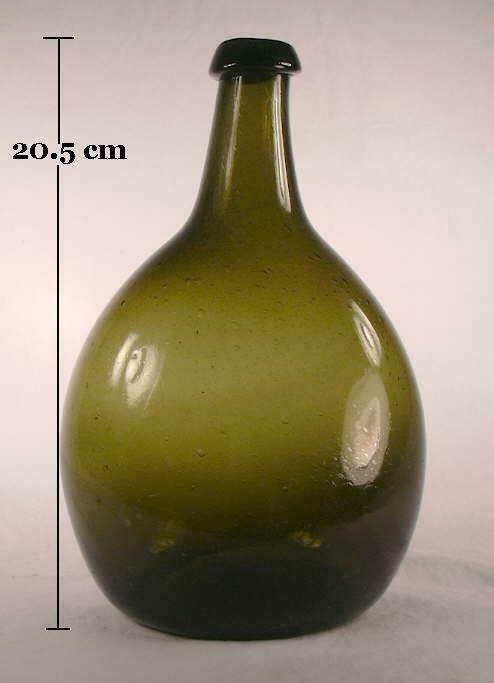 In addition, Switzer's (1974) book The Bertrand Bottles - A Study of 19th-Century Glass and Ceramic Containers and the California Archaeological Reports No. 20 (Schulz, et al. 1980) also contain information on Hostetter's within this age range, though this would not be obvious from the titles. Treasure in a Cornfield - The Discovery and Excavation of the Steamboat Arabia (Hawley 1998) is about another Missouri River steamship which sank in 1856, salvaged in the 1980s and which had at least 11 bottles of Hostetter's on board. 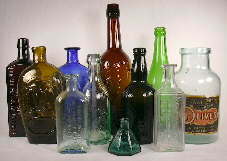 A quick search on the internet also turned up an excellent article on Hostetter's on the Federation of Historical Bottle Collectors site at the following URL: http://www.fohbc.com/images/hostetters.pdf, as well as numerous other potential information sources. 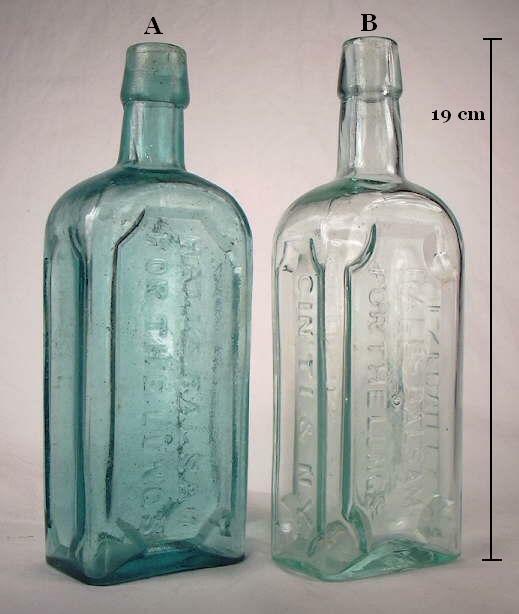 All these information sources - particularly Wilson & Wilson's (1969) book - refine the likely manufacturing dating for this particular Hostetter's to between the late 1850s and mid-1860s, although similar square, embossed bottles were made for the product until at least 1924 (Schulz pers. comm. 2006). Because of the likely regional distribution of the Celro-Kola product there would likely be less information available on it. However, there is some which is quite useful in narrowing down the age. Fike's (1987) book notes that the product was advertised in 1898 and 1910 in Portland. This is not inconsistent with the dating done above but is on the earlier edge of the range. Ron Fowler's (1975) book "Soda: The Oregon Bottlers" notes that the Celro-Kola Company began in 1915 and operated until 1929. This sets the earliest date for this bottle as 1915, further refining the probable age as somewhere between 1915 and the early to mid 1920s. The product Celro-Kola was also bottled earlier in a mouth-blown bottle (not pictured) which was produced by the Phil Blumauer Company. That companies products are also known to have been sold in label only (unembossed) bottles in the 1920s (click HERE for an explanation on one of the Finish Styles pages). Fowler does note that Phil Blumauer was the President of the Celro-Kola Company when formed in 1915. All this points to the following conclusion - the product was in existence prior to the Celro-Kola Company being formed which explains the advertising in 1898, but our Celro-Kola bottle can be pretty confidently dated between 1915 and the early to mid 1920s. This brings to an end the Dating page examples. It is not always easy to find all the information you desire on a specific bottle as is noted and outlined in the examples above. However, one can usually ascertain something more about most historic bottles if one is willing to spend some time doing additional research in libraries, on the internet, museums, and other places. This website is designed to provide a user some quick - and hopefully reliable - general dating and typing information...the rest is up to you.